Here is another recipe that I couldn’t believe I had never blogged before? This Loaded Bacon & Ranch Potato Salad is a staple around here! It goes good with just about anything, but we especially love it as a side for any type of grilled or smoked meat. 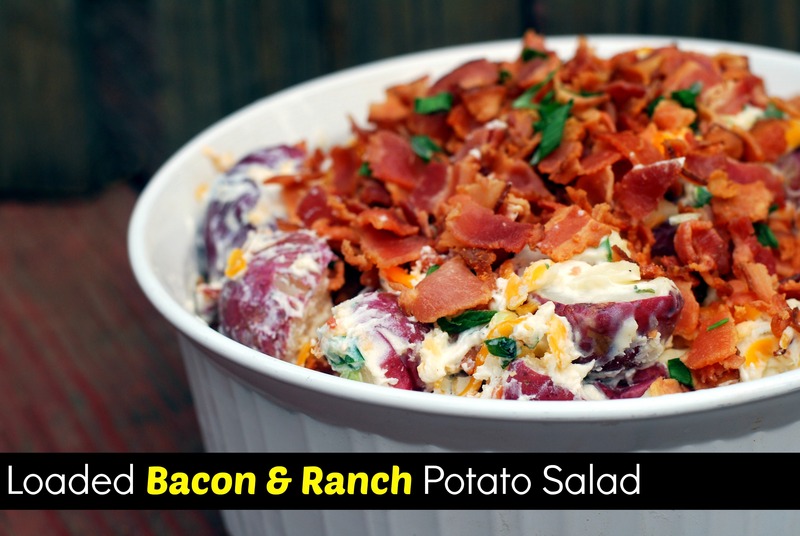 Bacon & ranch potato salad recipes have been around a WHILE. The biggest difference in mine is I use way more bacon than most people 😉 This is a huge hit if you are looking for a dish to bring for a party. And definitely make it a day ahead of time to give the flavors a chance to meld. If you like bacon, ranch & cheese (and who doesn’t? ), then this recipe is for you! Click here for our GO TO Southern BBQ Style Potato Salad Recipe!! SO GOOD! This German Potato Salad is one of my ALL time favorite sides! Click here for the recipe! Place potatoes in a large pot and cover with water. Bring to a boil and simmer for about 15 minutes, or until tender. Drain well and let cool completely. In a large bowl, stir together sour cream, mayonnaise, and Ranch dressing packet. Add cooled potatoes, cheddar cheese, and green onions and stir to combine. Top with bacon and cover and refrigerate for several hours or overnight. Serve and enjoy!